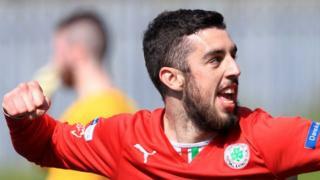 Cliftonville's convincing victory over Glenavon puts them three points clear at the top of the Irish Premiership table with just two matches to go. Joe Gormley, Martin Donnelly (2), Marc Smyth and Stephen Garrett got the goals for Tommy Breslin's men at Solitude. As well as being three points better off, Cliftonville have a goal difference advantage of 12 over third-placed Linfield.